The team was great. We called with a small problem (pilot light was out in two fireplaces) and Roberto came right away and fixed them. Very nice, very professional!!! 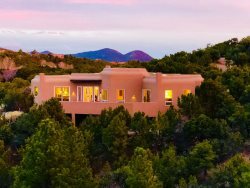 We have been to Santa Fe numerous times over the years and Casa Gabriella was the perfect way to visit Santa Fe! It's such a beautiful home with all the amenities of home including fabulous art and is so close to the square and Canyon Road! We just loved everything. Hated to leave. From my initial call, to times in the past where I needed some assistance, to reviewing rental properties Casas de Santa Fe has always been professional, caring and responsive. The property is well lit and inviting on the day you check in, making you feel welcome and at home. WE love Bishops Lodge Villas! We have been all over Santa Fe and what we like the most is after a long day, when you arrive back at the villa it is so quiet and relaxing. It is so very close in time and miles to the city, but it feels like you are nestled away from the madness and excitement so you can recoup your energy for another day! Your receptionist was cheerful, helpful and pleasant. Response to a request for firewood and propane for the BBQ was quick and efficient. Our home was comfortable and sooo attractive. We loved every minute there. I love the requirements you have for your rental Casitas- the styles, the fine linens and furnishings. It always seems to be above par! We enjoyed our two week stay in Santa Fe. We enjoyed the proximity to the center of town. Loved the hospitality of your crew. Sending a recommended itinerary was a great idea. I would not be opposed to an offering of a returning discount because I am considering making more of Santa Fe's festivals besides the wine and chili. So if all of your properties are not full during the Opera season or next July during the Folk art festival, send me an e-mail 30 days out so I can get a plane ticket:)) I will round up people to go with me. I love it when property owner's have better art than me. Makes me happy to just enjoy the architecture and art. Thanks again.